K&N 1955 Chevy just back from getting painted. 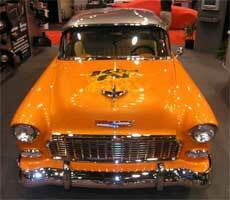 K&N 1955 Chevy on display at SEMA in November 2005. Our ‘55 Chevy 210 sat in the garage of K&N Engineering for years, just a shell of its former self, conjuring images of a ghostly past of Elvis Presley haircuts and poodle skirts. We purchased it for $11,000 when it was 45 years old from a man in Hemet, California. 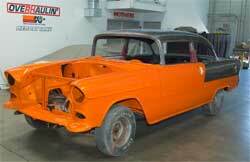 The primer was nearly done on our Chevy’s body, the fenders and doors were painted red. It sat in our garage for 5 more years unchanged, but when the Chevy turned 50, there was a sudden urgency in the air. K&N had a plan to restore it for SEMA (The Specialty Equipment Market Association) 2005. “We decided to do it sometime around the end of August,” said John Hudson, K&N shop supervisor, one of the key players in the restoration process. “The first thing we did was take it apart, next we had it sandblasted.” After that, it was time have the paint job done. 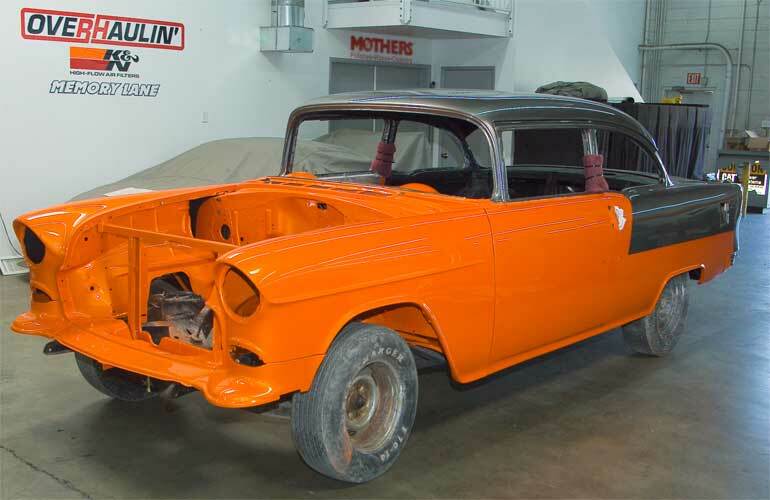 When that was finished we brought the ’55 Chevy back to K&N Engineering in Riverside, California, evoking a momentum that began a 20 day restoration process that took us into the wee hours of the morning, sometimes seven days a week. K&N decided to go with a stock look and just a hint of retro. The colors had to stand out, the way General Motors and its domestic rivals did when they dominated the auto market in North America back in the 50s. “Platinum & Sunset” were selected as the exterior colors. 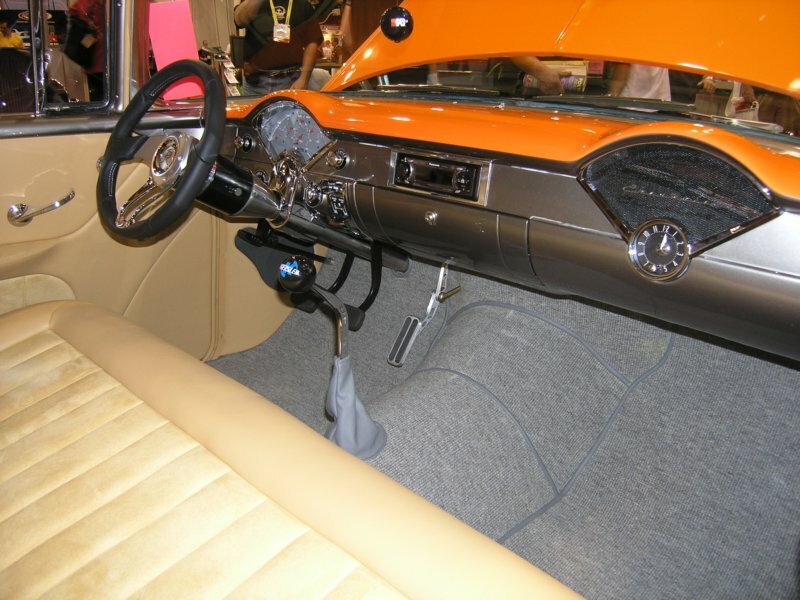 The bench seats of our ’55 Chevy are all original and were meticulously restored. It is a unique match to the exterior, tan morphed with a splash of orange. The carpet is grey. K&N put in new windshields, but all the trim and seals around the new rollup windows are original. “It’s not from our Chevy, but they are Chevy parts from ’55 or ’56,” Beltinck said. The door trim is original, but the mirrors are after market parts. The Flaming River three-spoke stainless steel tilt column steering wheel is in place along with the original dash. The only piece of aluminum surrounds the radio. The Panasonic CQ-C990IU radio is digital, designed to be seen and heard. “It has a screen that is programmable, we can run K&N video when the Chevy is sitting or running,” said Beltinck. The light switches are also all original and the LoKar gas pedal is powder coated in black. K&N worked hard to have our Chevy physically together for SEMA, it looked so together, there was an offer of $125,000 to buy our Chevy. By the way that was without the latest engine. However, K&N could not part with its new baby. Our Chevy will be fully equipped and make its debut in March 2006 at the Goodguys Rod and Custom Show in Pleasanton, California. We have put a General Motors small crate motor from its high performance line. The 383 engine cranks out 425 HP. Our K&N engineers said it will go 100 plus MPH without a problem. 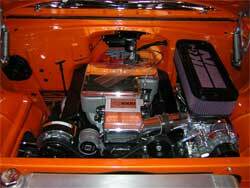 Our Chevy 210 has a K&N midget air box. A 4-cylinder sprint car box modified to fit on a ’55. We went from 4 holes to one on the bottom of the air filter. It’s supercharged and helps maintain the clean looking theme. 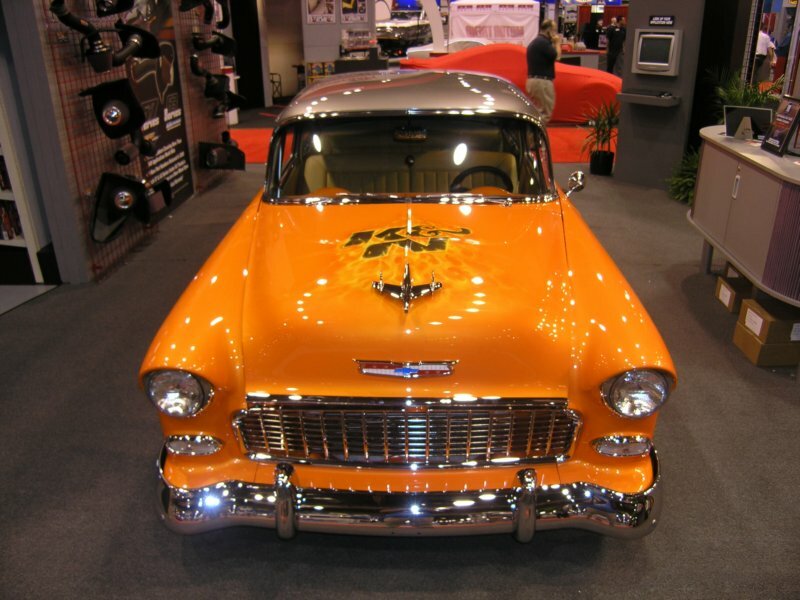 After Pleasanton, in June 2006, our ’55 Chevy 210 will join the Hot Rod Power Tour in Florida. When we go on the road it will have an air conditioner and a complete replacement set of tires. What a car! Here is a list of the contributing cast and crew for our restored K&N ’55 Chevy. For more pictures from SEMA click here. See the K&N website for information about K&N products for your vehicle.